Offices, lobbies, reception areas, clubhouses… We provide Full Service Interior Design to create pleasing and effective spaces for your place of business or community development. With our help and a few adjustments, you can choose either to stay in your current home or move to a new home for the remainder of your life. We create interior spaces that make moving about easier for anyone, regardless of age, size and/or ability. Live easier in your space with our help. by Linda Madani and Debbie Lang, "The Voice of Real Estate"
It was a joy to work with Linda Madani to make our vision of a master bedroom suite a reality. Linda has a high level of integrity that is coupled with a zen like presence, such that no obstacle is too great. She found creative solutions to problems while suggesting updates that turned problems into enhancements. Linda has infinite patience. Her listening and organizational skills kept the project moving. She never made us feel rushed but yet maintained focused, so the project was completed in a timely manner. It was a pleasure to work with Linda, both in her remodeling of our five bathrooms and in the redesign of our daughter’s bedroom. Linda was creative and detail-oriented in her designs, and our bathrooms are now the modern, airy spaces we desired. At every single step of the process Linda listened carefully, offered suggestions, and delivered results. I could not be any happier! The transformation of our daughter’s room was equally impressive. Here, she applied her fabulous skills to create a room that reflects the needs of a growing teen and beyond. It was a wonderful experience working with Linda. I whole-heartedly recommend her. Creating a warm, relaxing home or office that perfectly reflects your personal tastes, preferences and lifestyle is Linda’s specialty. She will oversee your project from design to completion, coordinating her experienced team of subcontractors to insure the finest craftsmanship and your satisfaction. Madani Interiors took an ordinary room and added architectural detail with custom bookcases floor to ceiling, box beam ceiling and improved lighting. 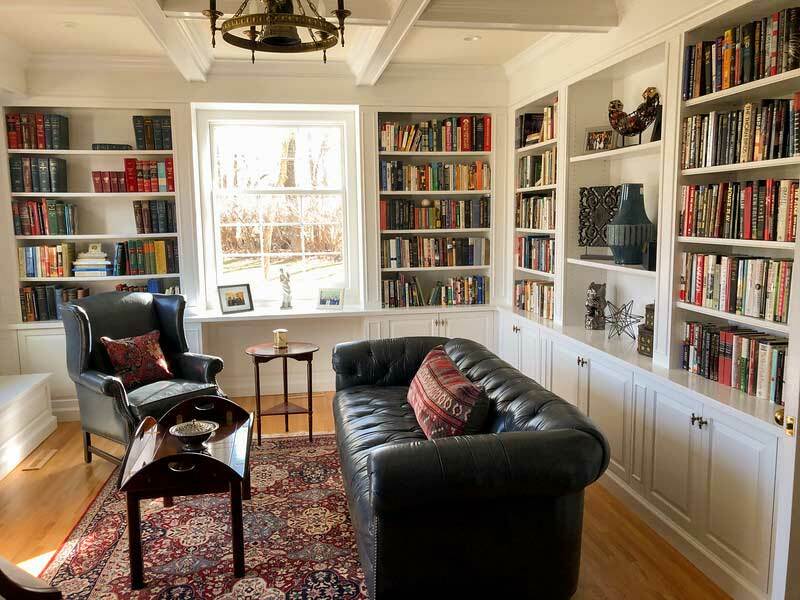 Now the client has a home for all their books and an environment to enjoy the precious time of reading.